Let’s be honest, waterfalls are pure magic. After jumping in a waterfall, I always feel cleansed, alive, awakened, and filled with a sense of childlike wonder. Wherever I travel, I do my best to find a waterfall. Bali is no exception, with waterfalls hidden around every corner of the jungle. Ubud if one of the best launching points for your waterfall pilgrimage. So grab your camera, and begin your adventure to these three most photogenic waterfalls near Ubud, Bali! When I travelled to Ubud to study Yoga, I had three lesser known waterfalls on my hit list. I gathered my adventurous soul sisters who were willing to get wet and share this waterfall experience with me. 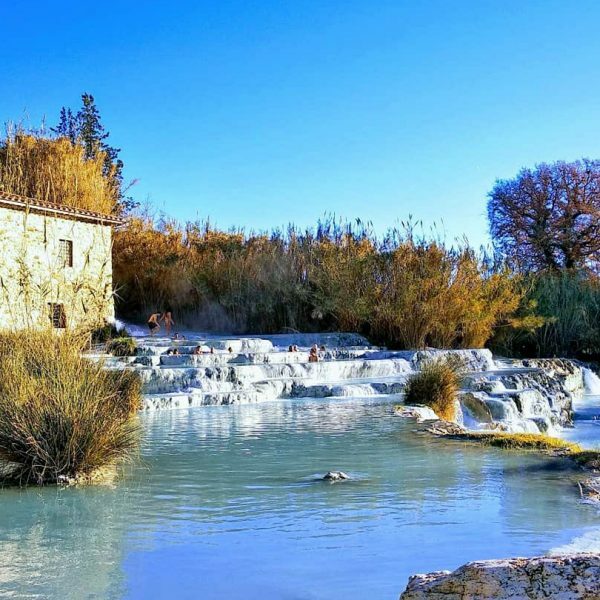 Each waterfall is incredibly unique and special, and of course Instagram worthy. They are all located relatively close to Ubud so we visited all three in one day, but you could make a day of visiting just one. 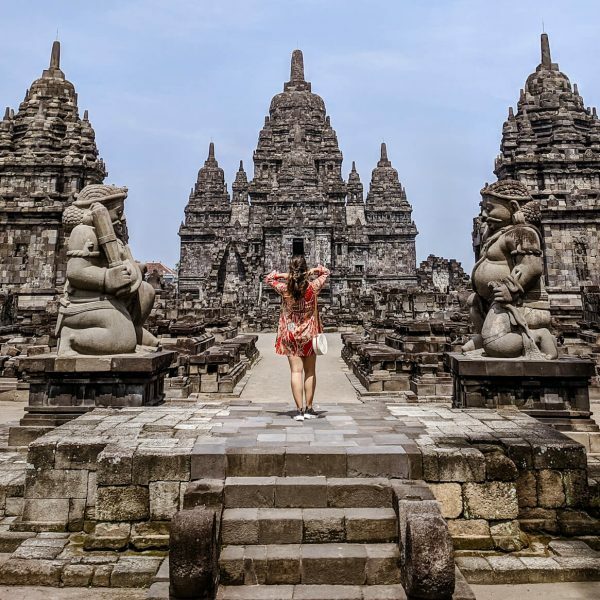 A wonderful adventure for your post We Are Travel Girls Bali Retreat! We can’t talk about Bali without talking about water. When you visit Bali, you will see that water is incorporated into all aspects of religious life, from daily offerings to ritual baths. Bali is famous for its many water temples and water rituals. 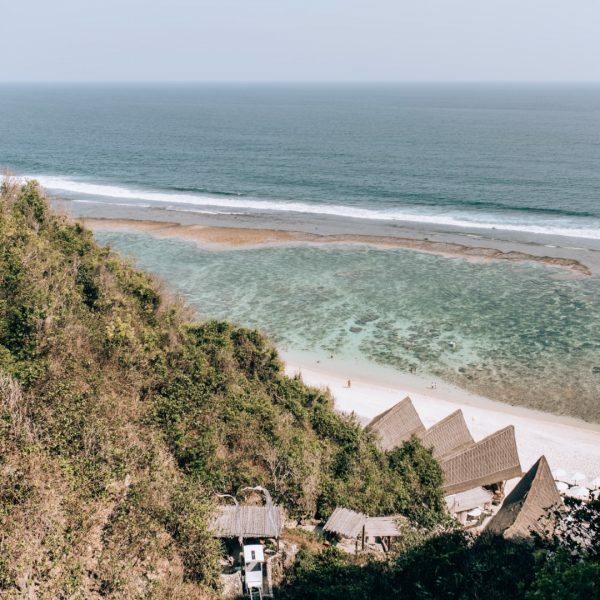 The particular sect of Hinduism practiced in Bali is called Agama Tirtha, meaning “Religion of Sacred Water.” Within this religion, water represents prosperity, healing, cleansing, and regeneration. In fact, waterfalls themselves are considered to be sacred places, nature’s temple. In Bali it is customary to offer respect when visiting bodies of water, and every waterfall has a designated temple area for offerings. Take note of these when you arrive so that you don’t miss the cultural and religious significance of the waterfall ahead. If you wish, you can also bring a traditional offering with you to present at the altar upon arrival. While it is normal to see foreigners swimming in the falls in bikinis, it’s a great idea to also bring a traditional sarong, and cover up whenever possible to show your respect for the land and customs. As always, remember to be respectful that these are considered to be sacred places, so try to reduce your carbon footprint and please do not litter. Keep these beautiful wild places plastic free and pack in pack out! Grab your bestie, a waterproof camera or GoPro, favorite swimsuit, and DO go chasing waterfalls! 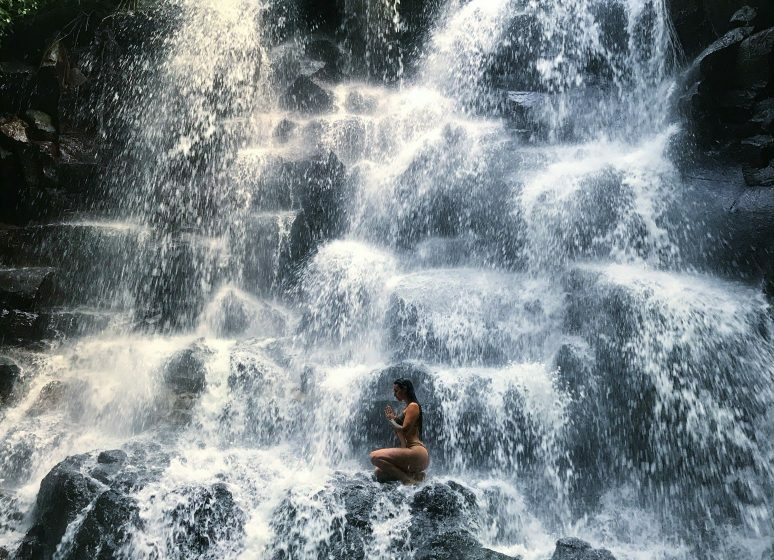 This secret waterfall is one of Bali’s hidden gems. It was a little bit tricky to find specific directions, but after a couple of detours, checking google maps, and asking some of the locals, we found it! In theory, it’s a half hour drive, but allocate some time to potentially get lost and need to ask for directions, as we did. 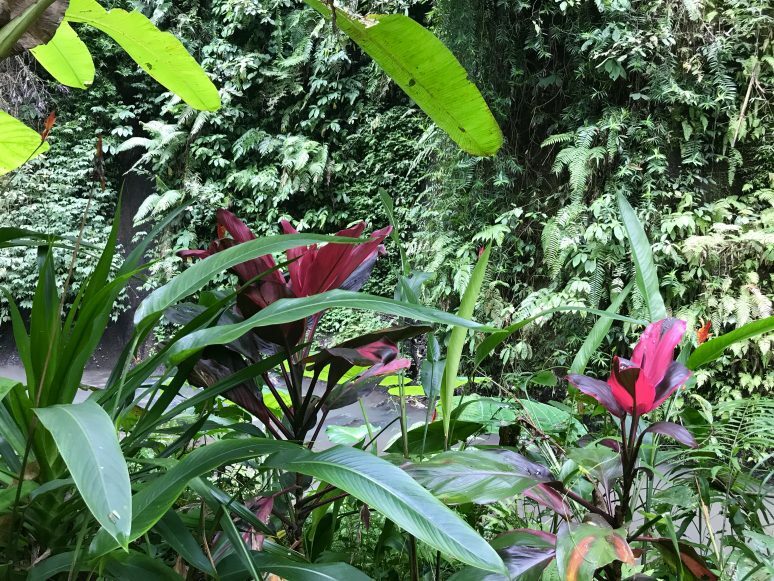 As you make your way down to the base of the falls, you’ll walk through vibrant green jungle flora dotted with butterflies and birds. The pathway was not treacherous, and it is suitable for most levels of fitness. Since it is lesser known, there were only a couple of people there when we arrived mid-day. You can also visit the nearby temple to the right of the waterfall on your way in. The waterfall has a perfect singular cascade, occasionally a twin fall after monsoons, and the perfect rock to stand on for that epic waterfall photo. It truly is a stunning vision to behold, an otherworldly paradise. Kanto Lampo is truly one of the most unique and beautiful waterfalls I have ever seen. It is a photographer’s dream. And thankfully, it’s only about a half hour drive from Ubud. With several rippling layers of falls cascading over a rock wall, Kanto Lampo offers an unforgettable experience. If you feel brave enough you can climb up the rocks under the cascades (with caution) for an epic baptism. You can also explore the area beyond the waterfall, making your way through the water passage into the jungle. Use extreme caution when climbing the rock wall! The rocks are slippery and the waterfall is very strong making it difficult to balance. If you love caves look no further, this cave waterfall will blow your mind. Although this waterfall is a bit of a drive, about an hour away from Ubud, it is absolutely worth a visit. After a short hike down, the jungle becomes a cavernous labyrinth. At the midway point of our descent, our driver kindly made an offering on our behalf to appease the water spirits. This may be something you wish to do on your own when you visit. You will walk through a vivid green canyon, almost as dreamy as the waterfall itself, which then opens up as you enter the cave. The huge cascade comes down through an opening at the top of the cave, as though descending from heaven. The view is simply breathtaking. My soul sister Kim and I took turns under the falls to experience that blissful sense of wonder. Outside the waterfall cave is a more open area of greenery and massive rocks. If you’re lucky, you’ll get a glimpse of the sun peeking through the treetops in sharp rays, which also makes for incredible photos. If you are a professional photographer and plan on slinging your fancy camera, make sure to pack your 50 or 35 lens to get this 15-meter cascade and surrounding cave all in one shot. Be prepared to hike a little bit and bring comfortable hiking footwear. With hundreds of waterfalls to explore around the island, it can sometimes be difficult to know where to begin. I’m confident that if you make your way to any (or all) of these three waterfalls, you’ll get a taste of the mystery and beauty the Bali jungles have to offer! We hope that this article has inspired you to visit Bali’s beautiful waterfalls. If you have any questions about the destination please leave these in the comments below. These area beautiful places I have seen before. Thank you for your post. I gain a lot of information from your post. If I have a chance, I will get to Bali for sure. I believe that I will have numerous unforgettable memories.